Located only one block from Parque Kennedy in the heart of the touristic, commercial district of Miraflores. 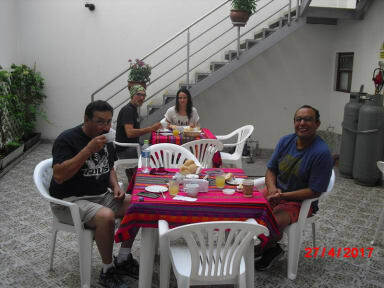 Kelebek is a nice, quiet, really convenient hostel located walking distance from the nice Miraflores area in Lima. The hostel itself is very safe, the staff are helpful and friendly. Breakfast at Kelebek is not particular impressive, but eating out in Lima is really inexpensive, The toilets are a bit too crampy, though clean and the showers have enough hot water. What I mostly liked about this hostel is its convenient location, cleanliness and quiet rooms. I will come back soon! Great place. Everything you need - clean, warm, safe, great wifi. Good location, you can walk around, 20 mins to the seaside, 2-3 mins to souvenir markets. Great, clean, safe stay. Good hostel for relaxing and central to sightseeing. Extremely friendly staff. Stayed at Kelebek Hostel for two nights. I was in a 6 bed room but actually I was on my own, so better really. The hostel is well located in Miraflores on a side street which is a bit quieter than other buzzing places. The hostel and toilets are very clean. Good size beds. Not much of an atmosphere but that's ok if you are out all day. The breakfast provided is a bit basic. Not much privacy in the toilets and place to hang your clothes when having a shower. Good place overall for 1-2 nights. This hostel had exactly what I needed. 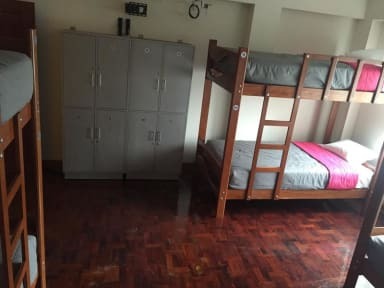 Nice dorms, comfy matresses a well equipped communal kitchen and a nice patio to hang around. It has a perfect location in Miraflores close to Parque Kennedy, the market and a supermarket. And the nice staff answers you every question you might have. The included breakfast is simple and good (scrambled eggs, bread, butter, jam, juice, tea, coffee). The hostel has a relaxed vibe and it is definitely not a party hostel if that's what you look for. This is a little way away from the heart of Miraflores, but is super close to some local markets. The staff was kind and the building was very well maintained. I wish there was a little more privacy in the bathrooms. Great location, close to the square. Owner was nice, place was clean, breakfast was sufficient. No suprises, got what I paid for, everything was good. Would have booked this place before we left for our return visit to Lima, but the night guy didn't speak english. Nice and quiet hostel well situated: easy to find and walk to when coming from the airport at night as a lone female traveler. There is a nice interior courtyard to use if weather permits. It has more of a home-stay feel than the traditional backpacker hostel. I was alone in my dorm the first night. The only downside is the shared bathrooms that are a bit cramped and lacking space to hang clothes. Overall, I enjoyed my stay for the two nights I was there. Stayed here two nights with very late nights getting in and very early mornings leaving. Quiet (never saw another person) and good place to rest. Close to the pickup in Miraflores for my day trip with PeruHop. Good hostel to chill out but nothing going on if that is what you want. Breakfast simple but fine, served 7-10 (which is fine until you realise most buses leave before that). Beds reasonably comfortable. Lockers too small to fit a normal sized travelling backpack or a suitcase but you can fit a daybag with your valuables in it. Bedroom doors don't lock but there is a secure door to enter which has to be opened by reception. Was okay for the end of a busy few weeks but not good to meet people.